CARLA is bright and eager. She wants to do everything other 8-year-olds do. But sometimes her body does not cooperate. Born with cerebral palsy, she has both spasticity (uncontrolled tightening of certain muscles) and athetosis (sudden, uncontrolled movements), which make walking difficult. Her knees bend and bump when she walks. To keep from falling, she uses crutches. Even so, sometimes she falls. At PROJIMO, Carla made her wishes clear. "I want to stand and walk better. I'm tired of these dumb crutches!" She had seen other children begin to walk better with below-the-knee plastic leg braces. "I want some of those things!" she insisted. On evaluating Carla's possibilities, Mari and Marcelo were unsure whether braces might help. By positioning her feet and ankles more firmly, braces might give stability and help her stand straighter. But they might also trigger more spasticity. Some experts used to say "Spastic and plastic don't mix!" But the PROJIMO team has found that plastic braces often work well for such children. Mari explained to Carla that the results would be uncertain. But the girl was still eager to try. Marcelo found some old braces that more-or-less fit Carla. She tried them. It looked like she stood and walked a bit better with them, and Carla said they gave her better balance. 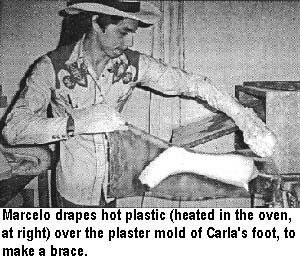 So Marcelo took plaster molds of her feet and made polypropylene below-the-knee braces. Mari and Marcelo asked Carla to walk between the parallel bars - first without the braces, and then with them - to compare how she walked. Without the braces she walked on tiptoes, with her knees quite bent. With them, the braces held her feet flatter and pushed her knees back. She stood more upright. Everyone, including Carla, agreed that with the braces her legs were straighter (more upright, less knock-kneed) and that she stood more firmly, with better balance. Within a few days, Carla began to walk without crutches. Although she still fell occasionally, she persevered. With her new braces she had more confidence and control - partly, perhaps, from the self-assurance she gained by feeling that people were listening to her ideas and wishes, and were including her in the problem-solving process. NETO is a shy, clever little boy from a remote mountain village. His grandfather brought him because, he explained, the boy was very small for his age and lacked energy. "He doesn't like to go with me to work in the fields any more," he said. "He's either sick or lazy!" "Grandpa!" objected the boy. "I keep telling you: my knee hurts." On examining Neto's right knee, Mari found that it bent further back than the other one. Behind it, there was a fluid-filled swelling (a herniated bursa, or Baker's cyst). Neto could not remember having injured his knee. Yet, the ligaments behind the knee appeared to be severely stretched. The knee bent back so far that, when the boy put his weight on it, he strained it and ran the danger of stretching it more. Mari asked Raymundo, the project's brace maker, to look at Neto's knee. Raymundo thought that Neto needed to wear a leg brace that would keep his knee from bending backwards - to allow time for the stretched tendons to contract enough to hold the knee straighter. "I don't want a big thing like that!" protested Neto, pointing to a child limping with a long-leg brace. "I can't wear one of those in the mountains. My leg won't bend at all! I'll break my neck!" "Would a small, light-weight below-the-knee brace, like this one, be better?" asked Raymundo, showing him one. Neto examined the brace doubtfully. "Would it stop my knee from hurting?" he asked. "We'll have to see." answered Raymundo. "Do you want to try one?" Neto nodded importantly. Raymundo took a cast of Neto's leg, with the foot bent up a bit from a 90 degree angle. Then he made a plastic brace. Neto's grandfather helped the boy to try it on. When he stood up, Neto's knee stayed straight, without bending backward. "It doesn't hurt now!" he said. "It's great! "But when he tried walking up a slope, he cried out in pain. "This thing's no good for the mountains!" he said. "On an uphill slope, the brace pushes your knee back," Raymundo observed. "I have an idea," He cut back the sides of the brace at the ankle, far enough to let the foot easily flex upward. Yet it still firmly resisted being bent downward more than 90 degrees. The boy tried it again on a slope. "Its much better!" he said. The PROJIMO team continues to see Neto periodically, and his back-knee has gradually became straighter. After one year he stopped using the brace. Now 3 years have passed, and he has had no further problem. The old way. Children with a back-knee are often given a long-leg brace. But many refuse to wear it because it holds the leg rigid, and is heavy and uncomfortable. Because the child can walk without it, he feels he doesn't need it. As a result, a lot of children develop permanent damage to their knees and some lose the ability to walk. A better way. In India, Dr. P. K. Sethi, inventor of the Jaipur foot (see page 119), has worked closely with villagers who had polio, to design a below-the-knee plastic brace which is an improvement on the one PROJIMO made for Neto. To keep the knee from bending too far back, this new brace extends above the front of the knee, and pushes on the lower thigh. The main disadvantage to this brace is that, when the person sits or squats, the top part of the brace sticks out above the knee. This makes it hard to use with long pants (unless a hole is cut in the knee). But because, in Indian villages, men as well as women traditionally use loose, wrap-around clothing, the brace presents no problem. Some persons with a weak leg walk by pushing on the knee with one hand, to keep it from collapsing. For such persons, Dr. Sethi designed a floor-reaction orthosis. The fore-foot is angled downward, so that when the person steps, his weight tips the brace backward, which pushes the knee back. ROBI first came to PROJIMO as a teenager, about 9 years ago. 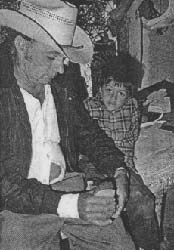 He'd had polio as a baby, and he walked with a limp, pushing with his fingers against his weak left leg to keep it from buckling. Robi had just gotten a job in a city warehouse. All day he had to carry large boxes. For this he needed both hands. But, because he had to use one hand to push his knee, he had to struggle to carry the heavy boxes with one arm. By the end of the day, he was so exhausted that he often thought of giving up the job. But jobs were hard to find, and his mother needed the money to feed the children. So Robi kept working ... "Is there anything you can do to strengthen my weak leg?" he asked. "We can make you a long-leg brace," suggested Marcelo. "No way!" exclaimed Robi. "I had one as a kid. It was awful! I walked with a stiff leg, and my foot dragged between steps. I walked better without it! Isn't there any way to support or strengthen my leg that will let me bend my knee between steps?" Marcelo rose to the challenge. He and Robi together designed a brace with a thigh-muscle assist. First, they made a cheap experimental model, using 2 pieces of plastic bucket and a band of rubber from an old inner-tube. The band was stretched in front of the knee between hooks on the plastic leg supports above and below the knee. After an early trial, improvements were made. 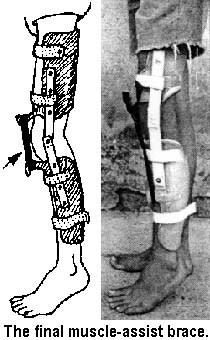 They connected the upper and lower leg supports with plastic hinges, to stop them from digging into the knee. Finally, they made an improved version, molding the leg pieces out of strong polypropylene plastic. To both Marcelo's and Robi's amazement, the device actually worked. 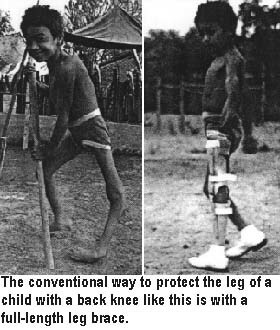 The rubber stretched in front of the knee helped to straighten it enough so that Robi could walk without using his hand. Yet, the knee bent between each step, so that he could swing his foot through without it dragging. Good ... but not good enough. This muscle-assist brace more-or-less served its purpose, for a while. But the rubber broke frequently. And sometimes it slipped, rubbing against his leg. Eventually, Robi stopped using it. When he returned, years later, PROJIMO's team had learned from Dr. Sethi about the floor reaction brace, and they made one for Robi. It worked better. Technologies improve when we learn from one other.